A CAT tool can also be a viable translation teaching tool? Who would have thought? Most of the people I have met / whose thoughts I have read since being back in Translation Studies seem to view CAT (Computer – Assisted Translation) tools as applications to be taught in specialised technical classes, with few connections to other translation classes where students and teachers can focus more on the art of translating without the technology always getting in the way. While I see why this view exists, I think most of its reasons have started to disappear since memoQ 2013 has come about. As a CAT tool, it’s got an awful lot going for it, and above all it has a brilliant community of users who keep talking to, constructively criticising, and almost always appreciating the brilliant team of developers (other times they are back to constructive criticism ;)). One of these new features of memoQ 2013 is the ability to define lists of errors which reviewers / translation teachers can use to annotate their students’ work. 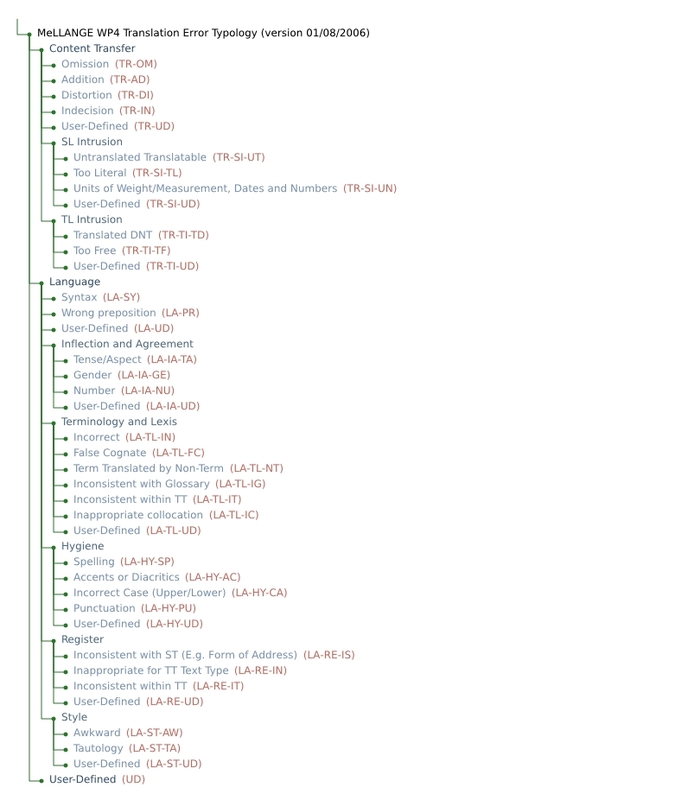 The LQA (Linguistic Quality Assurance) module of memoQ 2013 has allowed me to resurrect the MeLLANGE Project Error Typology we developed back in 2006-2007 with a consortium of fun partners in order to annotate the Learner Translator Corpus. An English version is available here, while you can also use the DE, FR, and IT versions in XML format from here. Now that I could incorporate it into memoQ, I thought I’d also share it on the Language Terminal as well – I hope it comes in handy. I find the LQA a very useful addition to a CAT tool: not only can error typologies be defined, but different penalties can be attached to them, and some automatic QA checks (such as missing tags, empty segments, incorrect/forbidded terminology) can be mapped against them. Last, but not least, you can specify thresholds for considering the translation acceptable or not based on these scores. No more of the “it sounds strange” arguments; you can meet your proofreaders/reviewers half-way by providing them with a tool to conduct their proofreading/review with, and in turn they will be able to demonstrate the valuable work they are doing on the translation. … and here is an example of a report detailing how many errors, of what kind, and of what severity (as you can see, after inserting a few errors to do with Hygiene I got excited about blogging and abandoned the actual process). I think this opens up new possibilities for effective collaboration within the translation industry. If, as a translation lecturer, you are still not convinced, there are a few more nifty tricks that memoQ 2013 has up its sleeve which may impress you. Just to wet your appetite, how about defining all the terminology resources you normally use to research terminology (online dictionaries / corpus & concordance tools / search engines / encyclopaedias) in one place, and then simply clicking one button to have the source language words/phrases you are not so sure about appear in all those resources without you needing to type anything else? If you are a more advanced user of memoQ and are looking for a lot more really useful tips and tricks, certainly keep an eye on Kevin Lossner’s excellent Translations Tribulations blog, as well as the very good Kilgray Knowledge Base. Next on my agenda: a few funky tricks with voice recognition in memoQ. Can automatic speech recognition already help verbatim reporters? Thanks a lot for the post! I had no idea what amazing features MemoQ 2013 has. This post only makes my resolution to study MemoQ stronger. By the way, I truly believe that one of the biggest omissions in formal translation education (at least as far as I’m aware) is that nothing is taught about using CAT tools. Meanwhile a translator who doesn’t use CAT tools can’t hope for stable career growth in the modern translation market – CATs are just critical advantage. memoQ is a very cool tool, Olga – I haven’t even got close to showing how very cool it is. Kevin Lossner is much better than me at that. Regarding the lack of CAT tools training, I am perhaps in the fortunate position of running an MA which has a year-long module dedicated to translation project management and CAT tools. We look at several tools and put our students through several baptisms of fire, but module satisfaction this year was 100% and quite a few of them have already found work in the language industry although they are technically still studying, and all that because of what they have been doing with CAT tools in Leeds (it seems that few programmes go in this much depth; maybe in the near future, though).